The La Junta Public Library began compiling a third volume in its 110-year history on March 1, 1997. A new $1,250,000 ten thousand square foot facility opened its doors to the public on that date. Designed to be a ‘library for the 21st century’, it became a reality after 1995 voter approval of a bond issue and sales tax increase. The new Woodruff Memorial Library was formally dedicated on April 23, 1997, exactly 76 years to the day since formal opening of a three thousand square foot building on the same site, the first to carry the name of Thomas T. Woodruff. A bronze plaque, a gift to the library from the school children of the city in 1921, has been preserved. It has been remounted next to the front door of the new building. In 1878, the Atchison, Topeka, and Santa Fe Railway had assigned the first freight and ticket agent to its ‘transfer point’, which the railroad president had ordered renamed ‘La Junta’. 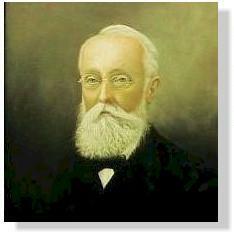 Agent James C. Denny was elected the first mayor when the city was incorporated in 1881. There was little growth until the Santa Fe built locomotive repair shops and a roundhouse and moved administrative offices to its new division headquarters in 1890-1891. The 1890 census reported La Junta’s population was 1,439. In 1888, Woodruff personally selected and shipped 735 books to his ‘agent’ in La Junta, attorney George Kilgore. These became the original collection of what would become known as the Young Folks Library. It opened on October 20, 1888, housed in Kilgore’s office located on the east side of the 300 block of Colorado Avenue. It would move three times in the next 32 years before getting a permanent home. Words on the 1921 dedication plaque were taken directly from labels Woodruff directed be placed in the front of each book. Some of the Young Folks Library is preserved in a special locked case near the entrance of the new Woodruff Memorial Library. The collection would grow to 20,000 volumes, almost all selected and purchased by Woodruff. “I remember several occasions when Mr. Woodruff would report purchases amounting to from $400.00 to $500.00 during the month and when the bill was approved he would give his personal check for the amount,” Kilgore recalled. Thomas Woodruff was also responsible for La Junta’s first librarian. In 1888, he employed Clara Sherwood and sent her from Boston. Until 1894, she served in the dual capacity of librarian and teacher in a free kindergarten, also established by Woodruff. After taking up permanent residence in La Junta in 1895, Thomas Woodruff personally took charge of the Young Folks Library, creating the first Library Board of Trustees. The Woodruff-directed and financially-supported Board assumed ownership of the library property and managed the Young Folks Library for the next 25 years. Following Thomas Woodruff’s death at the age of 80 on January 31, 1919, acting in accordance with his ‘declarations of trust’ the Young Folks Library Trustees transferred responsibility to the city and a new ‘Board of Directors of the Public Library of the City of La Junta’. Woodruff’s bequest included five lots that had been selected by Woodruff as the ‘proper place for the location of a public library building’, a check for $16,208.60 to start a building fund, property to be sold and proceeds added to the building fund, plus rental income property to be used for library maintenance. On May 31, 1920, a $34,600 contract was awarded for construction of what would be dedicated on April 23, 1921 as the Woodruff Memorial Library. The city-appointed Woodruff Memorial Library Trustees operated under the library laws of the State of Colorado until 1967, when the citizens of La Junta adopted a ‘home rule’ charter. The charter recognized the Board of Trustees, still appointed by city council, as the library’s independent governing body, subject only to annual budget approval and appropriation of operating funds. After more than a decade of study and consultation with three different architects, but enjoying more direct and active backing from city administration and technical support from all city departments, on March 20, 1995 the Library Advisory Board formally went on record to City Council recommending construction of a new facility for Woodruff Memorial Library. Council responded by directing the library question be put to a vote of the people. In an historically close city election on November 7, 1995, the library bond issue passed by a 10-vote margin, 1,008 -998. Along with the new building and increased use have come new services. For the first time in over 25 years the library expanded its hours. The library went from 49 hours a week, open only 1 morning, to 55 hours and open Monday through Friday morning and additional hours on Sunday afternoon. On October 8, 1997 the Matthew Nicklos Memorial Children’s Technology Center was dedicated. The Technology Center included two high speed computers with a color printer and lots of great educational software for use by children. The funds for the program, which exceeded $12,000, all came from private donations. The Library was finally connected to the world. As part of the Connect Colorado partnership to connect Lower Arkansas Valley schools, libraries, and institutes of higher education, the library received a computer and Internet access. Gates Foundation grants allowed the purchase of additional computers dedicated to public access of the Internet. Through the changes of the past, into the present and as surely into the distant future, Woodruff Memorial Library remains faithful in serving the citizens of La Junta and the surrounding area. T. T. Woodruff’s dedication to providing for the information and literary needs of La Junta lives on in the library that bears his name.